'Halo In Rosewood' (O. David Niswonger, R. 1993). Seedling# 51-89. TB, 33" (84 cm), Midseason bloom. Standards old rose; falls pale lilac with old rose band; beards white base, tipped tangerine. 'Minted Halo' X 'Kabaka'. 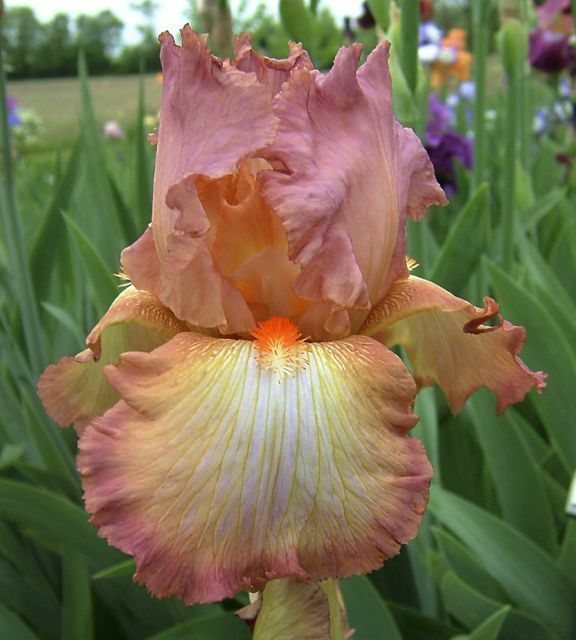 Cape Iris 1993. Honorable Mention 1995; Award of Merit 1997 . From AIS Bulletin #289 April 1993 Introducing HALO IN ROSEWOOD (Niswonger '93) Sdlg. 51-89: Minted Halo X Kabaka. TB, 33", M. This is an old rose blend with a pale lilac flush in the falls surrounded by a deep old rose band. The beards are white-based with tangerine tips. This should also do well on the show bench with its superb branching and wide, semi-flaring, ruffled falls. It's fertile both ways and should produce many colors of halos. EC 1990. $35.00. Cape Iris. JPG HaloInRosewoodSI.JPG manage 256 K 16 Apr 2019 - 15:39 Main.TLaurin Photo by Sandy Ives.